As usual, I am curious to know how was your week, on and off Stardoll. For me it was very exciting as there was Eurovision Song Contest that had it's final yesterday. Even I am a bit sad my country did not win, I am pretty satisfied with the winner - Sweden. The song is is really fantastic. Anyway, on Stardoll we did not have much releases, but the ones we had were pretty good. Read on if you missed something. On the first day of a week we got a new release in Fantasy Hotels furniture store. The collection is named "Aman Tokyo", and once again, we got an Oriental themed release, furniture this time. The items are a bit unusual, and I love that. There are also some quite useful pieces, like the pool, shopping bags, paintings, and some not so common, like Portable Tea House and Japanese Lantern, stuff like that. It is nice collection, and great for upcoming Summer. On Wednesday, duh, I hate repeating myself each time, but I guess you are already guessing what I am going to announce - a new Callie's Picks collection. This collection is named "Color Splash", and as you can guess, it consists of a lots of different clothes in different colors. At least it is supposed to be like that, as I see most dark colors with not so much colorful pieces. I am not a huge fan of the collection, really, there are only few items that caught my attention, which I bought as well, such as black jumpsuit, Elle skirt, and some accessories. Callie decided to re-release the infamous Moschino skirt, and make it Royalty only. Even I was Royalty at the time, still I decided not to buy it just to resell it later, I already have too many stuff I could sell. Anyway, my guess we are getting CP Decor next week, and I am hoping to see some cute cats, (or other animals, but preferably cats). And the highlight of a week was a new Limited Edition collection release, which happened on Friday. The collection is named "LE is Love", which is kinda cute. The collection consists mostly of pastel colors, flower designs and mesh patterns. There are so many beautiful pieces, and I am really sad my Royalty membership ended just a day ago. Still, I hated all the waiting and anticipation, so I am kinda glad I missed that. Prices are high, as usual, and I don't really like paying that much for stuff anymore. I guess other think the same, as there are some items that are not sold out yet. I am not sure they would look good on my too pale doll anyway. Still, I am looking forward to seeing items from previous collection getting available to be sold in bazaar, so I could try find some nice and affordable pieces. - Floors in our suites are wooden, instead of plain. Nice change, but how about removing those doors as well? - We got an update in our Stardesign Fashion and Decor, one of the main things is that annoying sewing machine being removed, and a slight change of layout. - Some of the old Holiday items are now available to be sold. 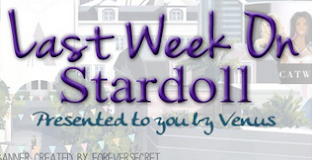 It is nice of Stardoll, and I hope they make some more items sellable as well. That sums up this week. What you loved and what you hated? What are your hopes and expectations for the next one? I am hoping for some Eurovision themed outfits, as there were many great ones on the show. Anyway, vote, comment, and see you next week.